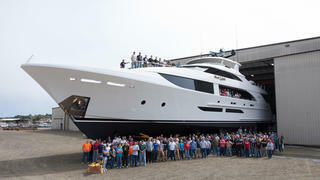 The first all-new model from Westport Yachts in seven years has been launched at the American yard and named Black Gold. Built from GRP for a repeat Westport customer who traded up from a Westport 112, Black Gold is the first hull in the Westport 125 series. She features a semi-displacement GRP hull and measures in at 38.1 metres LOA. Westport is renowned for its long-running series — for example hull number 55 in the Westport 112 series was launched last year — so any new design from the Washington state yard is greeted with much fanfare. The Westport 125 has been in development since late 2014 and features a full-beam main deck master suite and contemporary interior décor as created by the in-house design team. Accommodation is for 10 guests split across five cabins, including two double cabins and two twins, while the crew quarters are suitable for a staff of up to five. Power comes from a pair of MTU 16V 2000 M96L engines for a total output of 5,200hp and a top speed of 25 knots. When trimmed back to her cruising speed of 12 knots, Black Gold will have a maximum range of 2,500 nautical miles. Black Gold is currently undergoing her pre-delivery sea trials and will go on display later this year at the 2016 Fort Lauderdale Boat Show.